I seem to have contracted something. It disabled my Norton 360. When I tried to run it, I got a message saying it is not a valid win32 application. I uninstalled and tried to reinstall it but it failed. I then tried to instal Antivir personal edition and it seemed to install but when i click on the icon, i get a message that says it is not a valid win32 application. I then tried to run Hijack this to generate a log - same error message. The only thing i have been able to do is run a Kaspersky online scan. I have attached the log rather than past it in as it is rather lengthy. I ran comb fix and post the log here. Couple updates, still can't run an anti-virus or hijack this - not a valid win32 application. Downloaded and ran Super anti spyware and it crashes the machine as it scans the registry. Can't boot in to safe mode. Get the screens and all and when I select safe mode, it just reboots, but not in to safe mode. Please do not try to run anything else yet as soon as you do it will corrupt it. You have a downloader trojan called Downloader.Agent.awf or Downloader.Agent.ayy. This trojan replaces legitimate files that are common on most computers with an infected file. It then moves the legitimate file to a "bak" or backup folder. Please follow the directions below to run FindAWF so we can identify the files that have been infected and the backups then restore them. Download FindAWF.exe from here or here, and save it to your desktop. 543269 Apr 30 2005 "C:\Temp\DVD43Free\DVD43_3-5-2_Setup.exe"
784896 Feb 17 2005 "C:\Program Files\dvd43\bak\dvd43_tray.exe"
526018 May 25 2007 "C:\Temp\DVD43Free\v3.9.0\DVD43_3-9-0_Setup.exe"
543269 Apr 30 2005 "G:\LocalBackup\Temp\DVD43Free\DVD43_3-5-2_Setup.exe"
98304 Jan 23 2004 "C:\Program Files\QuickTime\bak\qttask.exe"
1134080 Sep 7 2001 "C:\Program Files\SecCopy\BACKUP\SecCopy.exe"
1142784 Apr 12 2004 "C:\Program Files\SecCopy\bak\SecCopy.exe"
15360 Aug 4 2004 "C:\WINDOWS\system32\ctfmon.exe"
13312 Mar 31 2003 "C:\WINDOWS\system32\bak\ctfmon.exe"
0 Oct 28 2003 "C:\Program Files\321Studios\Platinum\bak\makedir"
0 Oct 28 2003 "C:\Program Files\321Studios\Platinum\tdf\makedir.dir"
59040 Feb 19 2008 "C:\Program Files\Common Files\Symantec Shared\bak\ccApp.exe"
118784 Oct 25 2005 "C:\Program Files\Common Files\Acronis\Schedule2\bak\schedhlp.exe"
831552 Oct 5 2006 "C:\Documents and Settings\Marc\Desktop\GoogleToolbarInstaller.exe"
3739648 Jan 1 2007 "C:\Program Files\Google\Google Talk\googletalk.exe"
1581768 Dec 17 2006 "C:\Program Files\Google\Google Talk\googletalk-1.0.0.100\googletalk-setup-upgrade.exe"
1606064 Mar 6 2007 "C:\Program Files\Google\Google Talk\googletalk-1.0.0.104\googletalk-setup-upgrade.exe"
1531784 Aug 16 2006 "C:\Program Files\Google\Google Talk\googletalk-1.0.0.96\googletalk-setup-upgrade.exe"
155896 Sep 19 2006 "C:\Program Files\Google\GoogleToolbarNotifier\1.0.720.3640\bak\GoogleToolbarNotifier.exe"
290816 Nov 11 2005 "C:\Program Files\Sunbelt Software\CounterSpy\Consumer\bak\sunserver.exe"
840000 Dec 12 1989 "C:\QooBox\Quarantine\C\WINDOWS\bak\jsgrgvfA.exe.vir"
47 Jun 9 2003 "C:\Program Files\BCMSetup\AutoRun.inf"
39 Jul 18 2002 "C:\Program Files\NewTech Infosystems\NTI CD-Maker\autorun.inf"
31 Mar 15 2004 "C:\Program Files\Ulead Systems\Ulead VideoStudio 8.0\Player\AUTORUN.INF"
46 Nov 2 2004 "C:\Temp\BartPEBuilder\3.1.10a\BartPE\autorun.inf"
110 Aug 23 2001 "C:\Temp\BartPEBuilder\3.1.10a\win-slipstreamed\AUTORUN.INF"
31 Mar 15 2004 "C:\Program Files\Ulead Systems\Ulead VideoStudio 8.0\Player\RunTimePlayer2.0\AUTORUN.INF"
490 Feb 17 2006 "C:\Temp\BartPEBuilder\3.1.10a\plugin\autorun\autorun.inf"
49 Sep 19 2003 "C:\Program Files\Ulead Systems\Ulead VideoStudio 8.0\Player\UVS8.0_Other_BakUp\RunTimePlayer2.0.20040309\AUTORUN.INF"
49 Sep 19 2003 "C:\Program Files\Ulead Systems\Ulead VideoStudio 8.0\Player\UVS8.0_Other_BakUp\RunTimePlayer2.0.bak\ALL\AUTORUN.INF"
46 Nov 2 2004 "G:\LocalBackup\Temp\BartPEBuilder\3.1.10a\BartPE\autorun.inf"
110 Aug 23 2001 "G:\LocalBackup\Temp\BartPEBuilder\3.1.10a\win-slipstreamed\AUTORUN.INF"
490 Feb 17 2006 "G:\LocalBackup\Temp\BartPEBuilder\3.1.10a\plugin\autorun\autorun.inf"
491520 Nov 24 2005 "C:\WINDOWS\system32\spool\drivers\w32x86\3\bak\fppdis2a.exe"
Scanning for 1117786 virus strains and unwanted programs. [INFO] The file was moved to '482e1be3.qua'! [INFO] The file was moved to '482f1c5e.qua'! [INFO] The file was moved to '47ee1d12.qua'! [INFO] The file was moved to '48211e8e.qua'! [INFO] The file was moved to '48261ea4.qua'! [INFO] The file was moved to '482b2a81.qua'! [INFO] The file was moved to '48302e08.qua'! [INFO] The file was moved to '48212e0b.qua'! [INFO] The file was moved to '482a2e10.qua'! [INFO] The file was moved to '48202e18.qua'! [INFO] The file was moved to '48202e14.qua'! [INFO] The file was moved to '47ed2dd9.qua'! [INFO] The file was moved to '466cb9a2.qua'! [INFO] The file was moved to '47ed2ddb.qua'! [INFO] The file was moved to '47f22ddb.qua'! [INFO] The file was moved to '47f22ddc.qua'! [INFO] The file was moved to '47f22ddd.qua'! [INFO] The file was moved to '47ec2ddf.qua'! [INFO] The file was moved to '47ec2de0.qua'! [INFO] The file was moved to '47f12de2.qua'! [INFO] The file was moved to '47f12de3.qua'! [INFO] The file was moved to '47ec2de6.qua'! [INFO] The file was moved to '47f02de8.qua'! [INFO] The file was moved to '4671b991.qua'! [INFO] The file was moved to '47ed2deb.qua'! [INFO] The file was moved to '47f02de6.qua'! [INFO] The file was moved to '47f22de7.qua'! [INFO] The file was moved to '4673b990.qua'! [INFO] The file was moved to '47ee2dec.qua'! [INFO] The file was moved to '47ef2dec.qua'! [INFO] The file was moved to '47f52dec.qua'! [INFO] The file was moved to '47f02ded.qua'! [INFO] The file was moved to '47f42ded.qua'! [INFO] The file was moved to '47f02dee.qua'! [INFO] The file was moved to '47ee2de9.qua'! [INFO] The file was moved to '47f12dee.qua'! [INFO] The file was moved to '482734b2.qua'! Ok but please no more scans unless instructed. 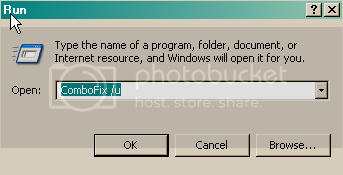 As some might get rid of tools that we need to delete the infections assome scans delete for example Combofix of find awf. Press 2, then press Enter. A Notepad document FindAWF.txt will appear with instructions to click below the line and paste the list of files to be restored. Right click below this line and select Paste, to paste the list of files copied to the clipboard earlier. Save and close the document. Here is the AWF Log file. Thanks. 784896 Feb 17 2005 "C:\Program Files\dvd43\dvd43_tray.exe"
98304 Jan 23 2004 "C:\Program Files\QuickTime\qttask.exe"
1142784 Apr 12 2004 "C:\Program Files\SecCopy\SecCopy.exe"
13312 Mar 31 2003 "C:\WINDOWS\LastGood\system32\ctfmon.exe"
0 Oct 28 2003 "C:\Program Files\321Studios\Platinum\makedir"
59040 Feb 19 2008 "C:\Program Files\Common Files\Symantec Shared\ccApp.exe"
118784 Oct 25 2005 "C:\Program Files\Common Files\Acronis\Schedule2\schedhlp.exe"
290816 Nov 11 2005 "C:\Program Files\Sunbelt Software\CounterSpy\Consumer\sunserver.exe"
491520 Nov 24 2005 "C:\WINDOWS\system32\spool\drivers\w32x86\3\fppdis2a.exe"
Here is the current AWF log file: Scan went rather quickly this time. After that please do a kaspersky scan again. Here is the Kaspersky log. There were literally thousands of the Recycler NTProtect entries so i deleted most of them to shorten up the log. I would go ahead and delete this only because I know it contains cracked software and can be infected. Again anything that had the original error about win 32 has to be reinstalled. Thanks for your help. I will be sure to donate.